Wow, what a week I have had. It’s been busy, tiring and absolutely amazing. 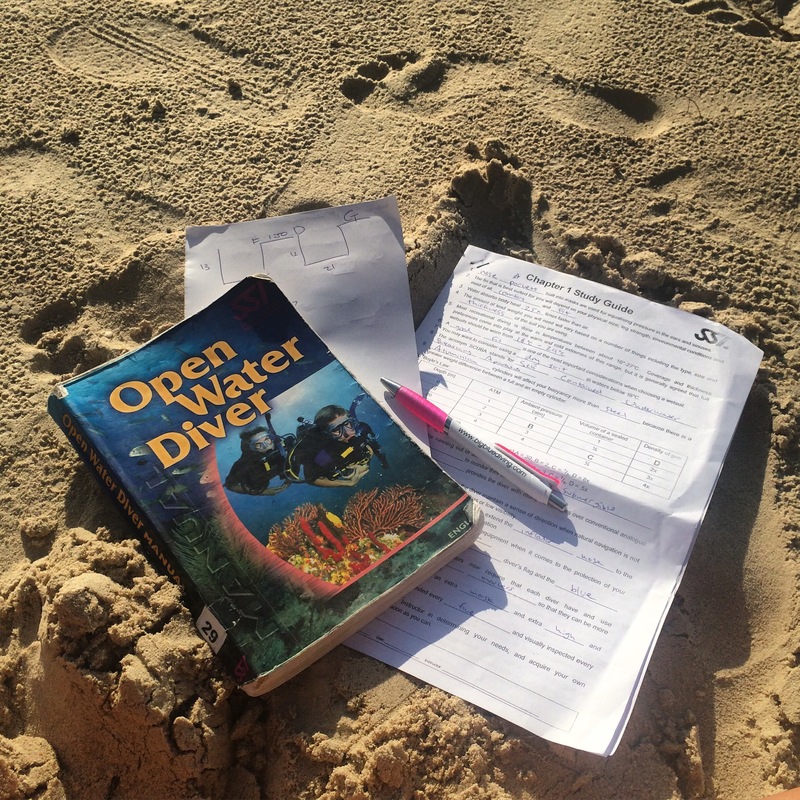 I spent my week getting my Open Water and Advance diver qualifications in one of the best places in the world to do it; Koh Tao, Thailand. I’ve always been interested in diving, and harbouring a deep love for the sea, I’ve dreamed of going diving for a while. At the same time, the prospect of diving also scared me a bit. Hypothetical scenarios would spin around my head: what if I run out of oxygen and drown, what if I encounter a blood-thirsty shark, what if my lungs collapse on the way back up. You get the picture. But I decided to face my fear and simultaneously follow my dream, and I’m so glad I did. I did my diving courses at Big Blue, a place I thoroughly recommend, and I was lucky enough the be paired with a great instructor and buddy. The first day was filled with theory and practicing in the pool, which really helped me feel comfortable with all the equipment. There was a lot of theory to study in a short amount of time, but I passed the test the next day with ease. Leaving the boring stuff behind, it was time for my first ever dive! I was very nervous putting on my equipment on the boat, preparing for that first dive. I’m pretty sure I made sure everything was working ten times over before feeling ready to jump into the ocean. All my nerves quickly disappeared though as soon as I deflated my BC and descended into the beautiful underwater world. It’s a hard sensation to describe; the feeling of weightlessness, feeling so close to nature. I left all my worries on the surface and completely enjoyed the beauty with no interruptions. With such a great first experience, you can imagine I greatly enjoyed my other eight dives even more. The more practice I got, the easier diving became. As part of my Advance course, I dove to 30m and also went on a night dive. The night dive was unlike anything I’ve ever experienced. We turned off our flashlights for a full 5 minutes and our movements lit up the plankton in the water bright blue, lighting the way for us. I was like a little kid waving my arms around in the water, the lit-up plankton was like fairy dust underwater. Besides the diving itself, I also really enjoyed being in the company of people for the whole week. I love solo travel, but it was a nice change to be around the same people for a week, to get to know them, to share experiences. It’s also made me feel more ready to conquer these last three weeks in Thailand alone. I’m currently still in Koh Tao; I decided to treat myself to a private room for 6 days while enjoying the island. I have no issues with shared budget accommodation, but allowing yourself some true privacy on your travels once is a while is needed, I believe. I’m heading to Koh Samui at the end of this week for the last leg of my trip, but for now, I’m thoroughly enjoying beautiful Koh Tao. sounds like you are having a great time 🙂 so you would strongly suggest doing the coarse down there ? Where are you know I’m north but will be south in 2 weeks 🙂 where is your adventure taking you ? I just got to Koh Samui! I’m here for two weeks before heading to Bangkok 🙂 how are your travels going?? Oh cool that must have been a great experience!! Can’t wait to read about it 🙂 Samui is great; love it here! Especially during low season; pretty empty beaches, so that’s a plus!